With 2 doors, 4 drawers, 2 open compartments and 2 matching medicine cabinets, the Avara 60-inch Vanity in Espresso with Double Basin Stone Vanity Top with White Porcelain Basins and Medicine Cabinets provides ample storage space to hide toiletries and towels while keeping the counter uncluttered. Blum soft close doors and drawers eliminate slamming and ensure tranquility in your bathroom. Brushed chrome hardware, single faucet mounts and square white sinks give the Avara a modern look that will perfectly complement any master bath. Avara 60-inch Vanity in Espresso with Double Basin Stone Vanity Top in White and Medicine Cabinets With 2 doors, 4 drawers, 2 open compartments and 2 matching medicine cabinets, the Avara 60-inch Vanity in Espresso with Double Basin Stone Vanity Top with White Porcelain Basins and Medicine Cabinets provides ample storage space to hide toiletries and towels while keeping the counter uncluttered. Blum soft close doors and drawers eliminate slamming and ensure tranquility in your bathroom. Brushed chrome hardware, single faucet mounts and square white sinks give the Avara a modern look that will perfectly complement any master bath. 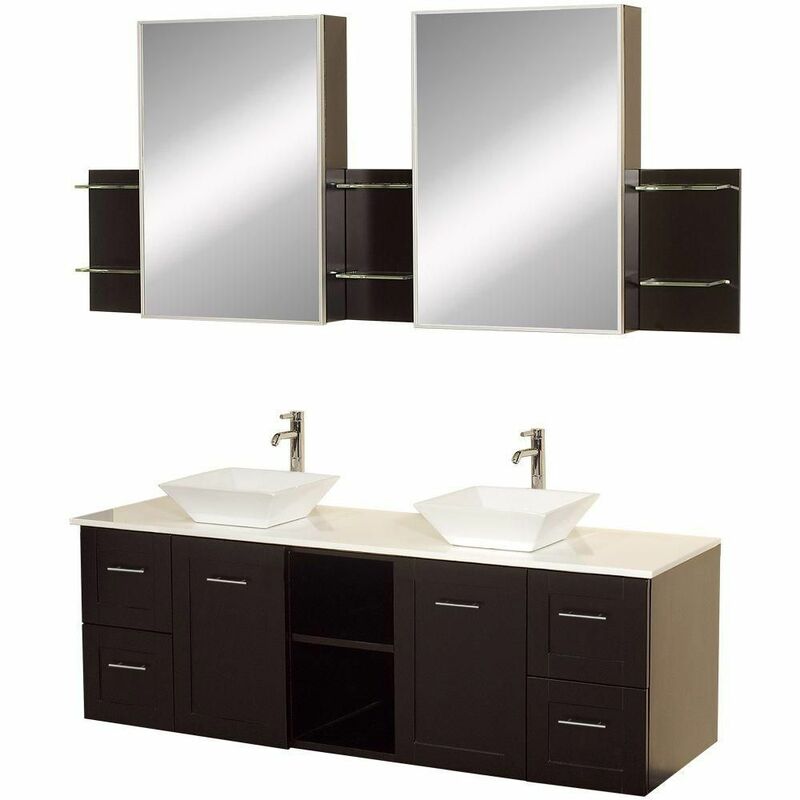 Avara 60-inch Vanity in Espresso with Double Basin Stone Vanity Top in White and Medicine Cabinets is rated 4.2 out of 5 by 5. Rated 4 out of 5 by Sanjay from The vanity unit has lots of storage. The medicine cabinets... The vanity unit has lots of storage. The medicine cabinets with the open shelves top the unit!!!! The only thing is that it requires tall faucets because of the vessel sinks and they are expensive!!! Rated 5 out of 5 by Rev from Loved it , built well and strong . Easy to assemble and directions were clear and helpful . Loved it , built well and strong . Easy to assemble and directions were clear and helpful . Rated 4 out of 5 by Anonymous from Very nice vanity Awesome quality and appearance. The only knock I have with it is the vessel sinks. They look great but are totally flat on the bottom. This design doesn't allow all the water to drain and little puddles stay on the bottom until they evaporate. Other than that, an awesome unit. I'm very happy with the purchase.